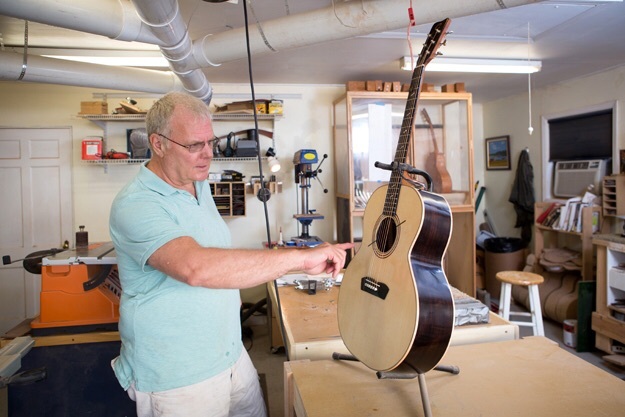 This website is devoted to the steps involved in planning, researching and assembling the materials necessary for building an acoustic guitar. I have been building guitars for more than 12 years, having studied with William Cumpiano, a master builder from Northampton, Massachusetts. I have built more than 50 guitars in my shop in Memphis, Tennessee. I have also taught individuals to build their own guitars. This website is devoted to teaching the steps I take to get ready to custom build a guitar. The goal of the website is to help you get ready to build your own guitar. Future website plans will move you through the process of assembling your own acoustic guitar.